We're getting to the end of the line, Hulkamaniacs. Just one more issue left after this installment and we're done. I'm thinking of posting a post-mortem about all of the tie-ins once they're available (next week). Meanwhile, I have nothing more to say except..."I'm ready for the Hulk's law!" When last we left our intrepid Warbound companions Elloe Kaifi and Hiroim the Shamed, Dr. Strange, dejected and defeated, his hands crushed by the Hulk in chilling answer to the question of whose side Banner was on (here's a hint: Hulk's, ingested the essence of the powerful demon Zom. That essence transformed him into a twenty-foot-tall, half-demon creature who immediately started laying waste to Hiroim and to the Sanctum itself before taking the battle to Madison Square Garden, which Hulk had made into a gladiatorial arena a la the Red King's on Sakaar. 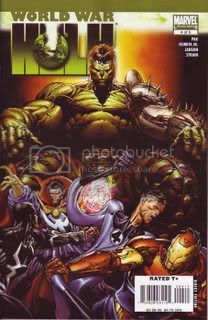 The Hulk watches while the spike-handed Zom/Strange battles Hiroim, and in a move that forces parallels, Zom/Strange demolishes the shamed priest's arm. (Some might say Strange has been a bit of a spiritual guardian for the Hulk in ages past, but now, Hiroim has assumed the role. The comparison is made concrete by the damage done to Strange's hands vs. that done to Hiroim's arm.) And while no one was there to help Strange out of his predicament, Hiroim can count on the support of the Warbound, who rush into battle. Finally, the Hulk finds an opponent who is his physical equal, perhaps superior, but whose mind is clouded with the rage of another. As previously noted, it's wholly against type for Strange to lash out physically, but consider that his Achilles' heel is his hands. Though he may not use them to cast spells, their severe damage strikes at the core of the character. Remember the Dr. Strange of old, the surgeon who believed that if he couldn't use his hands to hold a scalpel, he was as nothing. This is that Dr. Strange, and it's clear to me this was Greg Pak's intention herein. It's Strange's own personal demon, in a manner of speaking. The battle goes badly for the Hulk at first, his awesome healing power the only thing that saves him from Zom/Strange's mace-hands running him through, not once, but twice. What drives Strange is clear: he took the damage to his hands personally, and has yet to see the Hulk contribute one act that hasn't been in his own self-interest. The Hulk, remember, threatened that he would raze the planet if his demands weren't met. He professed to not care for the "puny humans" as now he came as the king of a sovereign nation. Hence, when Zom/Strange throws the Hulk into a building which threatens to collapse upon firemen (including what seems to be the same fireman from #1) and some innocent civilians who stayed behind, he is shocked too find after the collapse that the Hulk has, in fact, saved those people, showing that he is not, at heart, the monster that he believed him to be. Stunned, Strange regains a bit of control over Zom, just in time to receive a "lesson" from the Hulk in the use of "real" power. The savage beating lasts only moments, and Strange doesn't put up much of a fight, perhaps because he too is fighting Zom from the inside. In the end, Strange lies as defeated as the rest, and Rick arrives as voice of Hulk's conscience. Rick questions why Hulk saved those people if he no longer cares for humans. He reminds him of Banner, who saved him on the G-Bomb test site that day the Hulk was born, many years ago. It's Banner who saves, isn't it, and the Hulk is Banner. No, says the Hulk, as he delivers one last blow upon Strange: "Banner is me." Are all of Banner's stronger instincts, wanting to save the puny humans, from the Hulk? It's an intriguing question. Books like Marvel Age Hulk posit just the opposite, that it's Banner's innate goodness and concern for his fellow man that carries through to the Hulk, giving him just enough of himself so that he can be considered a hero, so that he saves people. What's true? A good question. Then again, isn't the Hulk just the kind to take credit for what he shouldn't? Or is this just another admission that the Hulk and Banner are two sides of the same coin? Next, Elloe Kaifi emcees the main event at Madison Square Garden, and it's a doozy. While throngs of Hulk's human supporters cheer, while aliens brought on the stone ship stand at attention, while the superheroes who stood between the Hulk and his quarry wince at the pain their obedience disks cause, Elloe reads off the names of the guilty parties and the charges leveled against them. Once again, the Illuminati protest their guilt, but are met with the sting of the disks' energies. Then ordinary people speak of the terrors perpetrated them by each member of the Illuminati. Black Bolt's people slaughtered a theatre full of opera-goers (Silent War #1); Mr. Fantastic and Iron Man cloned Thor, and that creation tore a hole through Bill "Goliath" Foster, killing him (Civil War #3); and Dr. Strange just laid waste to the city when he drank the essence of Zom (just earlier this issue). It's the pathos of the Hulk that brings it all together: "Don't like it, do you? It's not fair. Not the whole story. You have excuses. Explanations. You're innocent. These people don't know what really happened. They don't know what's in your heart. Now you know how it feels." It's been the Hulk who's been misunderstood as well all these years. Every time he tries to save someone, tries to beat up some bad guy menacing Earth, people see him as the bigger monster. No matter how much good he might do fighting off the Leader's latest attempt to rule the Earth, he always seems to have some karmic debt over his head that'll never be paid off. That's the way it goes, and it's always been so. Back in the makeshift arena, Reed fights Tony with a mace, while Dr. Strange and Black Bolt fight with hooked staves. Hiroim admits they've gone too far, and Korg is inclined to agree that they've taught the Earthmen a lesson--but it doesn't end there. Through intense pain, Tony is able to use his Extremis enhancements to hack into some of the armed Death's Head guards to attack the Warbound. However, they force him to use his new talents to attack Reed instead. Reed then knocks down Tony, raising the mace above his head, ready for the killing strike. Quoth the Hulk: "How 'bout that...looks like we're all monsters now." Miek baits the Hulk for a decision as the people in the seats cry out, "Kill him!" Rick stands incredulous, and the Sentry watches from his widescreen television. Hulk thrusts his thumb down...and the Sentry, upon seeing that his friend has decided to allow a death in his name, flies into action, reiterating Tony's words: "It's time to play God." Again, this issue urges us closer to the final confrontation, and it seems Sentry is poised to take down the Hulk once and for all. I'll go into why the Sentry's the right man for the job, and much more, next installment. No doubt the darkest installment of WWH. I think, realistically, there is no difference between "hulk is banner" and then hulk saying "no, banner is me." While at first it may sound like hulk saying he is dominant, i think if you look deeper, there really is no difference. Bruce is the hulk. period. One thing that I think Pak has done really nicely (albeit, VERY subtle) is play with the notion that it doesn't make any sense to think of them as two people, or really even two personalities. So yes, its the Hulk saving those people. because the hulk is bruce. just like bruce wouldn't let those people die, neither would the hulk.